Visible Ink Press : Which president started out as a sports radio announcer? 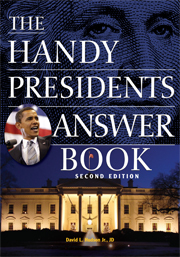 Which president started out as a sports radio announcer? He won a record amount of electoral votes when he was reelected. His first elected office was governor of California. He and his wife led the "War on Drugs." He was called "The Great Communicator." After graduating college, what did he do? Reagan worked as a radio announcer. He worked for WOC in Davenport, Iowa, and then WHO radio in Des Moines, Iowa, where he broadcast Chicago Cubs baseball games and Big Ten football games. He became a popular regional announcer. Whom did Reagan defeat in 1984 to win reelection? Reagan defeated Walter Mondale, Carter's former vice president. Mondale made history by announcing that he had chosen a woman as his vice presidential candidate--Geraldine Ferraro of New York, a U.S. Representative. Reagan dominated the election, winning 525 electoral votes to only 13 for Mondale. Reagan's 525 electoral votes remains a record in American presidential election history. Yes, Reagan had two marriages. He married actress Jane Wyman on January 26, 1940, in Hollywood, California. The couple divorced in 1948. Reagan married a second time to actress Nancy Davis on March 4, 1952, in San Fernando Valley, California. What was his first political office? Reagan's first political office was as governor of California. He won his first term in 1966 with a win over Democratic incumbent Pat Brown. He won reelection in 1970 with a win over Jesse "Big Daddy" Unruh who had sparred with Reagan from his position in the California legislature. He declined to seek a third term, leaving the office in 1975. Reagan cracked down on student protestors in his first term and pushed through welfare reform in his second term. What was the "War on Drugs"? The War on Drugs was the catchphrase used by the Reagan administration to define their efforts to combat what many saw as a crack epidemic in the country--a drug that devastating many urban communities particularly. Reagan signed into law a 1986 criminal law that imposed mandatory minimums and created greater sentences for drug traffickers. First Lady Nancy Reagan participated actively in the fight against drugs with her national campaign: "Just Say No." "Why was Reagan called "The Great Communicator?" Reagan was called the Great Communicator because he was a powerful speaker who had the ability to charm his viewing and listening audiences.